Aim: The aim of this study was to evaluate the influence of different concentrations of Ethylenediaminetetraacetic acid (EDTA) solution on adhesion, that is, the bond strength of the different adhesive systems, to the pulp chamber dentin. Materials and Methods: Recently extracted, sound, human, third molars were cut horizontally to expose the pulp horn. The roof of the pulp chamber and pulp tissue was removed. The teeth were then divided into five main groups. The teeth in each group were treated as follows: group 1, irrigated with saline; group 2, with 5% EDTA for 5 minutes; group 3, with 15% EDTA for 5 minutes; group 4, with 17% EDTA for 5 minutes and group 5, with 19% EDTA for 5 minutes. Treated specimens were dried and divided into 2 subgroups for adhesives; bonded with a total-etching adhesive (Adper Scotchbond Multi-purpose - ASB) or a one bottle of self-etch adhesive system (Clearfil S3 Bond - CS3). After the bonding procedure and composite restoration, teeth were sectioned and dentin sticks were obtained from each group for micro tensile testing (n = 10). Micro tensile testing was performed and scanning electron microscope (SEM) photographs were taken for each irrigated group. Results: In the ASB group, saline showed statistically higher bond strength values at the different concentrations of EDTA, while the micro-tensile bond strengths of the different concentrations of EDTA were not statistically different. In the CS3 group, saline and 5% EDTA showed statistically higher bond strength values than 17% and 19% EDTA, while the micro-tensile bond strengths of 15% EDTA compared to saline and 5% EDTA and 15% EDTA compared to 17% EDTA and 19% EDTA, were not statistically different. Conclusion: This study showed that EDTA irrigation can affect the bond strength of adhesive systems on pulp chamber lateral walls. Clinically, low EDTA concentrations can be recommended if self-etch adhesives have been selected. The net influence of pulpal floor features on bond strength is difficult to predict, and the structure of pulp chamber walls is complicated as it contains predentin, regular and irregular secondary dentin, and high tubule density with large tubules. On the other hand, accessory canals reported to occur frequently on the pulpal floor of molars may also assist in mechanical retention. The bond strength between the pulp chamber walls and adhesive systems is affected by the irrigants used during the root canal treatment. Although the bond strength after irrigation with Ethylenediaminetetraacetic acid (EDTA) was demonstrated in previous studies,  the effect of different concentrations of EDTA has not been studied. Thus, the purpose of this study was to compare the effect of different concentrations of EDTA solution on resin-bond strength and to evaluate the bond strengths of two adhesive systems (total etch and self-etch adhesives) to the pulp chamber walls. The null hypothesis of this study was that the bond strength of adhesives would not be affected by different concentration of EDTA irrigations. Recently extracted sound human 15 third molars were selected for this study. The teeth were stored in distilled water at room temperature before their usage. The teeth were sectioned through the pulp chamber roofs using an Isomet saw under water lubrication (Buehler, Lake Bluff, IL). Pulp tissue was carefully removed without touching the inner surface of the pulpal wall. The teeth were divided into five main groups. Group 1: An unirrigated control group (immersed in 0.9% saline); Group 2: 5 minutes 5% 10 ml EDTA; Group 3: 5 minutes 15% 10 ml EDTA; Group 4: 5 minutes 17% 10 ml EDTA; Group 5: 5 minutes 19% 10 ml EDTA. After irrigation with EDTA, all teeth were rinsed with saline for 2 minutes as the final irrigation. Then, all the groups were divided into subgroups as shown in [Table 1]. The adhesive systems, a total etch (Adper Scotchbond Multi-Purpose) and a self-etch (Clearfil S3 Bond) were applied to the pulp chamber walls according to the manufacturers' directions. The resin composite was condensed into the pulp chamber and cured in 2 mm layers on the the bonded surface (3M ESPE Elipar FreeLight 2 LED, Germany). The output of the curing light was checked with a radiometer (Hilux UltraPlus Curing Units, Benlioglu Dental Inc., Turkey). The adhesive systems and composite resins used in this study are shown in [Table 2]. Ten dentin sticks were obtained from each group. The ends of each stick were attached to a micro-tensile device (Bisco Microtensile Tester, USA) using a cyanoacrylate adhesive (Zapit, DVA, Corona, CA, USA) and stressed in tension at a speed of 1 mm/min. The microtensile bond strengths data were determined (MPa), and all data were analyzed by one-way analysis of variance (ANOVA) and for comparison with the differences in the subgroups, Duncan's multiple post-hoc test was performed for ASB and CS3 groups separately. After the test, fractured surfaces were examined under a stereomicroscope (SZ-PT Olympus, Japan). Failures were classified as adhesive failure (failure between resin and dentin interface), cohesive failure (failure in dentin or composite resin) and mix failure (mixture of adhesive failure and cohesive failure same time). In order to observe the samples under a scanning electron microscope (SEM), five recently extracted sound human third molar teeth were used. The pulp chamber dentinal walls were treated as: 1) saline; 2) 5 minutes 5% EDTA; 3) 5 minutes 15% EDTA; 4) 5 minutes 17% EDTA; and 5) 5 minutes 19% EDTA; after which all the teeth were rinsed with saline for 2 minutes. All the disks were then coated with a thin film of gold in a vacuum evaporator (Polaron SC500 Sputter Coater, VG Microtech Inc., Japan) and observed under SEM (JSM-5600, JEOL Ltd, Tokyo, Japan). The mean micro-tensile bond strength values in MPa and standard deviations are shown in [Table 1] for all groups. In the ASB group, saline showed statistically higher bond strength values than the different concentrations of EDTA (P < 0.05), while the micro-tensile bond strengths of the different concentrations of EDTA were not statistically different (P > 0.05). In the CS3 group, saline and 5% EDTA showed statistically higher bond strength values than 17% and 19% EDTA (P < 0.05), while the micro-tensile bond strengths of 15% EDTA compared to saline and 5% EDTA compared to 17% and 19% EDTA were not statistically different (P > 0.05). 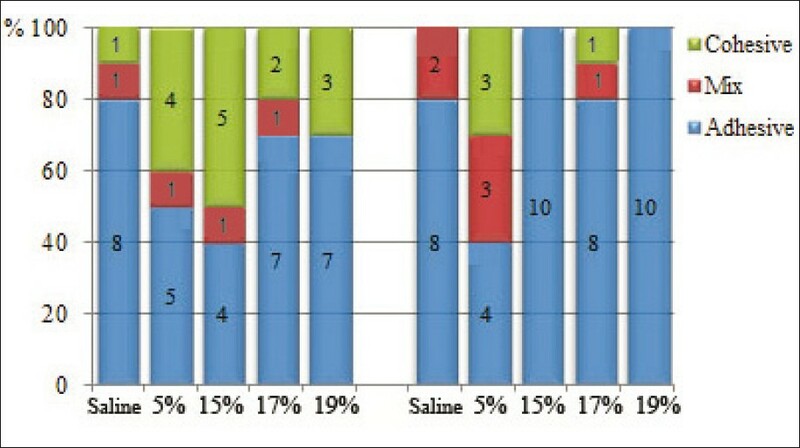 All statistical results are shown in [Figure 1], and failure types are represented in [Figure 2]. In the SEM observations of the pulp chamber lateral walls, there was no smear layer in any group because all procedures were performed without touching the dentinal walls. An irregular dentin surface was observed in the specimen irrigated with saline and with 5% EDTA. SEM photographs of pulp chamber wall dentin after rinsing with saline only revealed smooth, open dentinal tubules with few remnants of pulp tissue. The SEM observations of the specimens irrigated with 15%, 17%, and 19% EDTA revealed the absence of irregular dentin surface [Figure 3]. Figure 2: Failure type of bonding agents after different Ethylenediaminetetraacetic acid irrigations. Endodontic chemical irrigants' have different effects on the bonding of pulp chamber dentin. EDTA has been used extensively in root canal treatment in identifying the entrance of calcified root canals and in removing smear layer. Also, although there is no scientific study for this usage, paste form of EDTA has especially been used as a lubricant. Currently, there is no consensus on the optimal time a chelating agent must be in contact within the root canal to adequately bond. In addition, the time needed for good cleaning efficacy of EDTA was recommended at between 1 and 5 minutes in several studies. The present results indicate that, when a total etching or a self-etching adhesive system was employed, the use of EDTA for 5 minutes, especially in high concentrations, had an adverse effect on the strength of the bond to the pulp chamber. However, further studies need to be conducted to determine the effects of EDTA on bond strengths of adhesives at different time intervals. In the present study, Clearfil S 3 bond was preferred as a self-etch adhesive in accordance with the previous study. On the other hand, ASB total etch bond has previously been used in many comparative studies. , Self-etch adhesives and composites may offer some advantages over the use of total etch adhesives. Self-etch adhesives have weak acids in their primer composition, which results in less change in the dentinal wall structure than with the strong acids of total etch systems. The application of primer without air-drying does not cause collapse of collagen fibrils at the dentinal structures. Also, self-etch adhesive systems simplify the bonding procedures and decrease the time needed for application. From the results of this study, it can be affirmed that self-etch adhesives still preserve their advantages over total etch adhesives. Within the limitations of this study, it can be concluded that there is a significant reduction in the bond strengths of both ASB total etch adhesive and CS3 self-etch adhesive to the pulp chamber walls after the application of different EDTA concentrations. From a clinical point of view, low EDTA concentrations can be chosen if self-etch adhesives are used. 1. Bailon-Sanchez ME, Gonzalez-Castillo S, Gonzalez-Rodriguez MP, Poyatos-Martinez R, Ferrer-Luque CM. Intraorifice sealing ability of different materials in endodontically treated teeth. Med Oral Patol Oral Cir Bucal 2011;16:E105-9. 2. Santos JN, Carrilho MR, De Goes MF, Zaia AA, Gomes BP, Souza-Filho FJ, et al. Effect of chemical irrigants on the bond strength of a self-etching adhesive to pulp chamber dentin. J Endod 2006;32:1088-90. 3. Vertucci FJ, Anthony RL. A scanning electron microscopic investigation of accessory foramina in the furcation and pulp chamber floor of molar teeth. Oral Surg Oral Med Oral Pathol 1986;62:319-26. 4. Gutmann JL. Prevalence, location, and patency of accessory canals in the furcation region of permanent molars. J Periodontol 1978;49:21-6. 5. Ausiello P, De Gee AJ, Rengo S, Davidson CL. Fracture resistance of endodontically-treated premolars adhesively restored. Am J Dent 1997;10:237-41. 6. Nakabayashi N, Kojima K, Masuhara E. The promotion of adhesion by the infiltration of monomers into tooth substrates. J Biomed Mater Res 1982;16:265-73. 7. Belli S, Zhang Y, Pereira PN, Ozer F, Pashley DH. Regional bond strengths of adhesive resins to pulp chamber dentin. J Endod 2001;27:527-32. 8. Kijsamanmith K, Timpawat S, Harnirattisai C, Messer HH. Micro-tensile bond strengths of bonding agents to pulpal floor dentine. Int Endod J 2002;35:833-9. 9. Inoue S, Van Meerbeek B, Abe Y, Yoshida Y, Lambrechts P, Vanherle G, et al. Effect of remaining dentin thickness and the use of conditioner on micro-tensile bond strength of a glass-ionomer adhesive. Dent Mater 2001;17:445-55. 10. Fawzi EM, Elkassas DW, Ghoneim AG. Bonding Strategies to Pulp Chamber Dentin Treated with Different Endodontic Irrigants: Microshear Bond Strength Testing and SEM Analysis. J Adhes Dent 2010;12:63-70. 11. Hulsmann M, Heckendorff M, Lennon A. Chelating agents in root canal treatment: Mode of action and indications for their use. Int Endod J 2003;36:810-30. 12. Scelza MF, Teixeira AM, Scelza P. Decalcifying effect of EDTA-T, 10% citric acid, and 17% EDTA on root canal dentin. Oral Surg Oral Med Oral Pathol Oral Radiol Endod 2003;95:234-6. 13. Ari H, Erdemir A. Effects of endodontic irrigation solutions on mineral content of root canal dentin using ICP-AES technique. J Endod 2005;31:187-9. 14. Kawasaki K, Ruben J, Stokroos I, Takagi O, Arends J. The remineralization of EDTA-treated human dentine. Caries Res 1999;33:275-80. 15. Rotstein I, Dankner E, Goldman A, Heling I, Stabholz A, Zalkind M. Histochemical analysis of dental hard tissues following bleaching. J Endod 1996;22:23-5. 16. Perdigao J, Eiriksson S, Rosa BT, Lopes M, Gomes G. Effect of calcium removal on dentin bond strengths. Quintessence Int 2001;32:142-6. 17. Garcia-Godoy F, Loushine RJ, Itthagarun A, Weller RN, Murray PE, Feilzer AJ, et al. Application of biologically-oriented dentin bonding principles to the use of endodontic irrigants. Am J Dent 2005;18:281-90. 18. Ballal NV, Mala K, Bhat KS. Evaluation of the effect of maleic acid and ethylenediaminetetraacetic acid on the microhardness and surface roughness of human root canal dentin. J Endod 2010;36:1385-8. 19. Sano H, Shono T, Sonoda H, Takatsu T, Ciucchi B, Carvalho R, et al. Relationship between surface area for adhesion and tensile bond strength--evaluation of a micro-tensile bond test. Dent Mater 1994;10:236-40. 20. Scherrer SS, Cesar PF, Swain MV. Direct comparison of the bond strength results of the different test methods: A critical literature review. Dent Mater 2010;26:E78-93. 21. Fortin D, Swift EJ Jr, Denehy GE, Reinhardt JW. Bond strength and microleakage of current dentin adhesives. Dent Mater 1994;10:253-8. 22. Perdigao J. New developments in dental adhesion. Dent Clin North Am 2007;51:333-57, viii. 23. Purk JH, Healy M, Dusevich V, Glaros A, Eick SD. 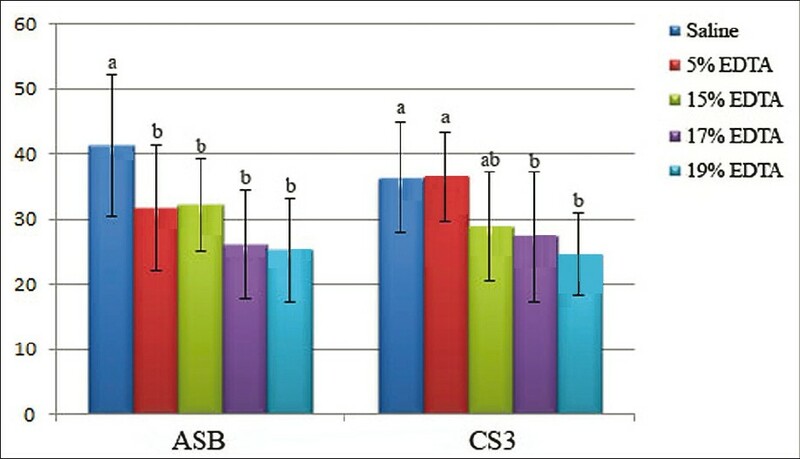 In vitro microtensile bond strength of four adhesives tested at the gingival and pulpal walls of Class II restorations. J Am Dent Assoc 2006;137:1414-8. 24. Ounsi HF, Salameh Z, Carvalho CA, Cantoro A, Gradini S, Ferrari M. Bond Strength of Composite Core Build-up Materials to Fiber-reinforced Posts: A Microtensile Comparison Between Conventional and Wet-ethanol Bonding Systems. J Adhes Dent 2009;11:375-80. 25. Frankenberger R, Perdigao J, Rosa BT, Lopes M. "No-bottle" vs "multi-bottle" dentin adhesives--a microtensile bond strength and morphological study. Dent Mater 2001;17:373-80. Kasraei, S. and Azarsina, M. and Khamverdi, Z.